Does Mouthwash Increase Your Risk for Type 2 Diabetes? A study, published in Nitric Oxide suggests that the use of over-the-counter mouthwash, particularly when used more than twice per day, can increase the risk of pre-diabetes and diabetes. The theory is that most mouthwashes contain antibacterial ingredients which can impair the oral microbes critical for nitric oxide formation and in turn predispose people to metabolic disorders, such as diabetes. This study comes at an interesting time, given that research over the last decade has demonstrated the role of the gut microbiome and health. Numerous studies suggest that disruptions in gut microbial populations may contribute to weight gain and insulin resistance, both precursors to pre-diabetes and diabetes. But, while the research on the gut has been ongoing, oral bacteria and its role in diabetes and pre-diabetes are less studied. Perhaps this study is on to something, but more research will be indicated in the future. The American Diabetes Association (ADA) reports that people with diabetes are at an increased risk of developing gum disease ( gingivitis) and serious gum disease (periodontitis) because people with diabetes are generally more susceptible to bacterial infection, and have a decreased ability to fight bacteria that invade the gums. Additionally, gum disease can cause blood sugars to rise, which can contribute to the progression of diabetes and complicate existing diabetes. The best way to prevent gum disease is to keep blood sugars controlled and practice good oral hygiene: receive regular cleanings, brush twice daily, and floss between meals. 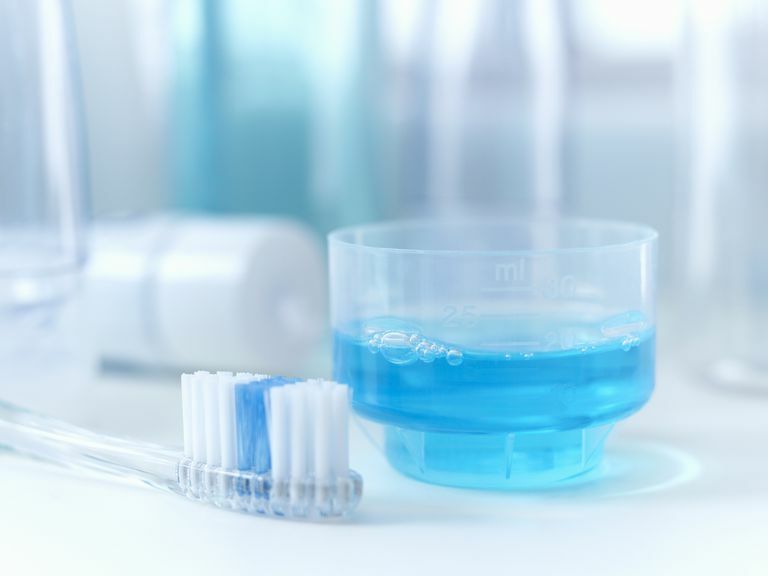 According to the study authors, there is well-established efficacy for mouthwash use and its fight against gingivitis, but not much evidence for reducing periodontitis. They believe that the long-term use of mouthwash may kill good bacteria (such as phylum Actinobacteria, which is inversely associated with type 2 diabetes) in the mouth and also abolish the ability of nitrate reduction, which has demonstrated to have a protective role in diabetes risk. Roughly 1,206 participants, ages, 40-65 were recruited by flyers and word of mouth. The population included 25 percent Caucasian, 14 percent African American and 61 percent mixed race. Of the 1,206 participants, 951 completed the three-year follow-up examination. At baseline, participants were given a 75-gram glucose tolerance test, and blood was drawn to assess glucose, insulin, HgbA1c, and C-reactive protein. Interviewers administered questionnaires to assess the frequency of oral hygiene aids including mouthwash use. They did not ask which specific mouthwash the participant used; rather, they asked about the frequency of use. Additional information, such as, age, gender, smoking, alcohol intake, hypertension, medication use, sleep breathing disorders, frequency of intake of high-risk diabetes food items, as well as time and frequency of exercise was recorded. Lastly, oral exams, dental plaque scores, and gingivitis/periodontal disease exams were assessed. Researchers found that those participants who used mouthwash greater than or equal to twice daily had a 55 percent increased risk of developing pre-diabetes or diabetes over a three-year follow-up compared to less frequent users, and a 49 percent higher risk compared to non-users of mouthwash. They also discovered that among those participants using mouthwash more than twice daily, 30 percent progressed to pre-diabetes and type 2 diabetes. Individuals who used mouthwash most often (greater than twice per day), were more likely to be female, to not have completed high school, to have sleep breathing problems, had higher dental plaque scores and drank less alcohol than individuals who used mouthwash less than twice daily. Although the data demonstrates a significant long-term impact of mouthwash on diabetes risk, there are several limitations of the study. While the researchers speculate the relationship between nitrate/nitrate levels and diabetes risk, they did not measure the nitrate/nitrite levels, or nitrate reducing oral bacteria and therefore could not definitely attribute their association with reduced levels of either. The study did not collect data on the amount of time the mouthwash was used. For example, did participates rinse for 30 seconds, 60 seconds? Could there have been a dose response? The study was comprised of mostly overweight/obese Hispanic individuals which may limit generalizability. Oral health and oral hygiene are important for everyone, including those who have diabetes, as we know that gum disease and oral health can impact blood sugar control. Antibacterial mouthwash has been shown to be clinically effective in reducing dental plaque and gingivitis. While it is possible that there is an association of diabetes risk, with oral microbes, the pros and cons of using mouthwash should be assessed and discussed with your medical team. Until further research is conducted we cannot be totally sure if and how using mouthwash can increase your risk for diabetes. In this particular study, though, there seemed to be an increased risk in those people who used it more than twice per day. So, perhaps if you are leery, you can at least reduce your use to no more than once per day to start. Additionally, always keep in mind, that there are many determinants that can increase your risk for diabetes—genetics, obesity, race, cardiovascular disease, etc. The likelihood that using mouthwash is the only determining factor of diabetes risk, is likely a long shot. American Diabetes Association. Diabetes and Oral Health Problems. Barlow GM1, Yu A1, Mathur R2. Role of the gut microbiome in obesity and diabetes mellitus.Nutr Clin Pract. 2015 Dec;30(6):787-97. doi: 10.1177/0884533615609896. Epub 2015 Oct 9.